This easy-to-chant Mantra Invokes The Divine Mother of Harmony as the Triumphant Light Of The Universe. She Who Is Rays Of Light Illumines the path for all Creation, Clearing obstacles to Unity and Harmony. The rhythm and vocals from Peace Mother and the Global Peace Musicians create a serenade, flooding us with Pure Love, Devotion, Joy and Inner Stillness, moving us to Sweetly chant along and dance with the Universe. Singing or listening to this Mantra will call in the Light Forces of Tranquility, Gratitude (Great Attitude), Creative Solutions and Support. Manifest an expansion of Harmony within you Self, others, all worlds, places, situations and all realities by chanting Jai Jai Maa, Jai Jagadambe Ambe Maa! 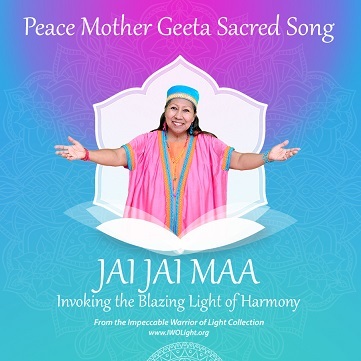 This Sacred Album and all products from the Shaman’s store are Blessed by the Holy Mother, Peace Mother Geeta Sacred Song and therefore carry Her Shakti and Her Power-full Intentions for the Healing and Upliftment of all Humanity.